Here I will write 3 methods of Hard Reset NOKIA E63. All these 3 methods will 100% works for your device So Read, Learn and enjoy... NOKIA E63 Hard Reset information step by step instruction Method 1: Hard Factory Reset of Nokia E63. Step 1: Press POWER button until your phone is ON. Step 2: Then go to Settings from the Main Menu. Step 3: go to Phone from the Settings Menu Step 4: go to Phone Management from the Phone Menu Step 5: go to Restore Settings from the Phone Management Menu Step 6: Now click on Restore Factory Settings. Now your phone will ask for Delete data and restore. Confirm this operation tap Yes. Step 6: Now enter your security code. (Your Reset security code is: 12345. The default Nokia E63 security code is: 12345) You have successfully finished all steps. (Your phone will start resetting..... Please wait. (This action may take several minutes.) You need to wait here until your restart and ready to use. and all you have done. See all steps at a glance: -Menu-> Phone ->Phone Management-> Restore Settings -> Delete data and restore. Confirm this operation -> tap Yes. Hi Friends, Today I will tell you that How to Hard Reset NOKIA E63? and after reading this tutorial, you will be able to Nokia E63 hard factory reset successfully because I have written step by step tutorial of hard factory resetting tutorial of Nokia E63. How to recover forget the password of Nokia E63? Yes, You also able to reset your device if you forget your device password if you follow this step by step tutorial. Warning: We advised you to keep back up your Nokia E63 phones settings before trying these codes. Save all phone numbers, important message and other information to the sim or memory card etc. Some phones clear the phone memory when it reset. Because hard reset will erase all of your data. Before going to Hard reset factory settings your Nokia E63, you need to know Nokia Code for proper use your phone and some additional information which you may find below from Frequently ask question FAQ. If you do this 4 things, then you are prepared for hard rest for your mobile phone. Now you can follow this steps to reset your Nokia E63. Method 1: Hard Factory Reset of Nokia E63. Step 6: Now click on Restore Factory Settings. Now your phone will ask for Delete data and restore. Confirm this operation tap Yes. See all steps at a glance: -Menu-> Phone ->Phone Management-> Restore Settings -> Delete data and restore. Hope this method will 100% work for your Nokia E63 hard factory reset setting. If you follow 1st method, then you don't need to follow 2nd or 3rd method. I will advise you to follow any one method. Now follow this second method. Method 2: Hard Factory Reset of Nokia E63. Now you can follow this steps to reset your Nokia E63. and dial this code *#7780# if you want to reset (Settings Only - Data will not delete from you Nokia E63 Mobile Phone). Hope this 2nd method will 100% work for your Nokia E63 hard factory reset setting. Learn all resetting method but follow any one method. Now follow this 3rd method. Method 3: Hard Factory Reset of Nokia E63. Now your Nokia E63 device will reset and restart. Hope this article will help you to hard reset your Nokia E63. If this article helps you, then share this article. If you want to know anything, then ask me by the comment. What you need to Know before Hard Reset or Factory Reset? Before going to Hard Reset of your Nokia E63 Mobile you need to know this Additional information for your mobile phones safety. 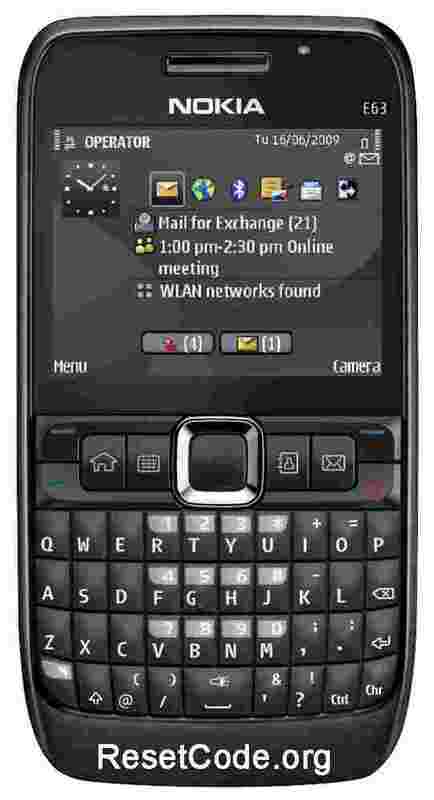 Hi, here I have write Some common important questions and answer on NOKIA E63 mobile which you need to know (FAQ). If you have more questions, then ask me here or let me know by comment. If you know any questions answer, them let me know I will update it. A: You need to hard reset NOKIA E63 mobile when you will get this following problem. Your NOKIA E63 mobile works too slowly or stops working. Backing up all applications which you installed on your NOKIA E63 mobile. After the hard reset, install them one by one. A: Hard factory reset will not any effect on your NOKIA E63 mobiles SD Card. Hard factory reset will not erase or delete your external memory cards data. A: First you should try to remember. You should not enter the wrong PIN code more than three. Actually, this is not a function of your NOKIA E63 mobile. It is a sim function. So if you lost your pin code or PUK code, then you can recover it from the customer service of your provider. And you can find it the sim card packet. Remember, the Hard reset will not help you to recover your sim card’s PIN Code or PUK code. A: No, The software and the operating system’s of your NOKIA E63 mobile phone will not be affected by the hard reset in a direct way. A: Yes, the factory reset will affect or delete all your points and levels in games which installed and perform on NOKIA E63 If the application or game is installed on its internal storage, If you do not want to delete your points and levels of games, then you just need to create the specific backup before hard factory reset. And after successful reset, you need to restore the games particular backup. A: Your NOKIA E63 will delete all user data and customer settings Without originally or preset from the company there). After reset your device will be the same as if it came right from the store. A: Factory data reset on NOKIA E63 deletes the addresses of all of your data but does not overwrite it. That way the device does not longer know where exactly the data is stored. There are ways to recover it. A: NOKIA E63 mobile phone Format Factory Reset is 100% safe and it should not affect the device. it is supposed to clearing all data and reinstalling the default setting.